PlagScan’s core technology makes use of a large index of all kinds of web sources and digital content. 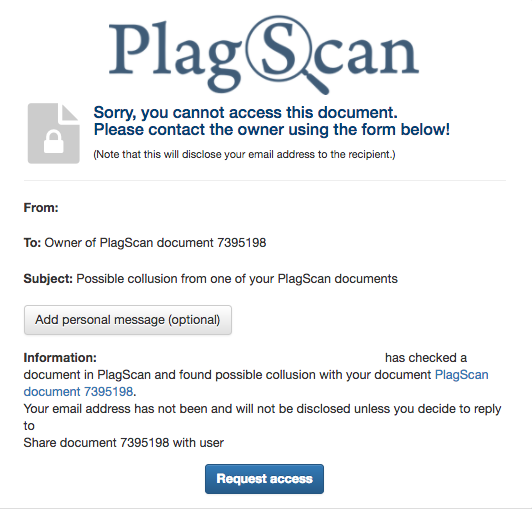 Aside from the internet as a source, PlagScan offers you access to the Plagiarism Prevention Pool. The PPP is an exclusive joint archive that enables the cross checking of new submissions with documents already submitted by other PlagScan clients. The pool expands constantly because it adds all submissions from participating institutions and publishers. Documents from participating organizations generally become part of the PPP. It is possible to mark certain documents as private in order to prevent them from being added to the PPP or to retract them afterward. Alternatively, organizations can opt-out entirely by choosing a private repository. However, we strongly recommend taking advantage of the PPP – one of PlagScan’s most valuable features. A broader database with other institutions allows for the cross-checking of new submissions against older ones. This eliminates the possibility of students plagiarizing prior work from relatives or friends across cohorts. If the software finds a match within a document from another institution, sources are only shown as snippets of three successive words to ensure the privacy of the original owner and source. If an institution wishes to access the document's full-text, the owner of the matched source has to grant explicit permission. If no permission is granted, the document won’t be accessible to the other institution. Click here to learn more about our data protection policy.